Pokagon State Park, nestled on the shores of Lake James, is a picturesque 1,260-acre park with hiking trails, beaches, an interpretive nature center, cross country skiing, boat rental and guided horse rides. 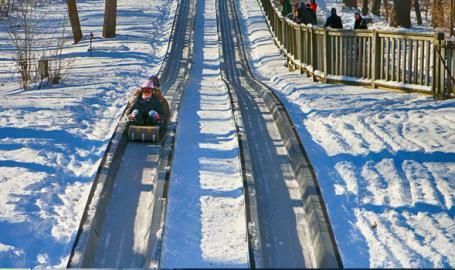 Pokagon is also home to the state’s only refrigerated toboggan. Open weekends the day after Thanksgiving through the last weekend in February, the toboggan is a great family activity. Toboggans rent for $13 per hour and hold up to four people. Potawatomi Inn, the 138-room hotel, offers two restaurants, library, cabin suites, gift shop and indoor pool.